We describe a method to target drugs to the central nervous system by either implanting a catheter or performing a bolus injection into the right lateral ventricle in mice. We focus specifically on the delivery of antisense oligonucleotides. This technique is readily adaptable to other drugs and to rats. DeVos, S. L., Miller, T. M. Direct Intraventricular Delivery of Drugs to the Rodent Central Nervous System. J. Vis. Exp. (75), e50326, doi:10.3791/50326 (2013). Due to an inability to cross the blood brain barrier, certain drugs need to be directly delivered into the central nervous system (CNS). Our lab focuses specifically on antisense oligonucleotides (ASOs), though the techniques shown in the video here can also be used to deliver a plethora of other drugs to the CNS. Antisense oligonucleotides (ASOs) have the capability to knockdown sequence-specific targets 1 as well as shift isoform ratios of specific genes 2. To achieve widespread gene knockdown or splicing in the CNS of mice, the ASOs can be delivered into the brain using two separate routes of administration, both of which we demonstrate in the video. The first uses Alzet osmotic pumps, connected to a catheter that is surgically implanted into the lateral ventricle. This allows the ASOs to be continuously infused into the CNS for a designated period of time. The second involves a single bolus injection of a high concentration of ASO into the right lateral ventricle. Both methods use the mouse cerebral ventricular system to deliver the ASO to the entire brain and spinal cord, though depending on the needs of the study, one method may be preferred over the other. Some drugs are unable to cross the blood brain barrier (BBB), requiring direct Central Nervous System (CNS) delivery. To circumvent the BBB, drugs can be delivered directly into the brain using the described methods. While our lab and the paper detailed herein focus on Antisense Oligonucleotides (ASOs), other drugs, such as small molecules, antibodies, gene therapy vectors, etc., can also be delivered through the exact same approach. Certain proteins play an instrumental role in the pathogenesis of neurodegenerative diseases. Such proteins often form toxic species and accumulate into aggregates, leading to eventual neuronal death and subsequent neurological disease 3-4. In an effort to slow or even halt the progression of these diseases, one therapeutic option may be to directly target and decrease the causative protein. However, these proteins are often found ubiquitously through the CNS, making it difficult to effectively target them on a global scale. In order to target genes throughout the entire CNS, we administer ASOs into mouse cerebrospinal fluid (CSF) via the lateral ventricle to bypass the BBB. This specific method takes advantage of the mouse ventricular system that bathes the entire brain and spinal cord, allowing widespread distribution of the ASOs. We use ASOs that are 18-20 mer RNA-like molecules that directly bind the target mRNA sequence and, depending on the ASO chemical modifications, either A) recruit RNase-H to degrade the mRNA leading to knockdown or B) shift alternative splicing 1,2,16,17. It should be noted that multiple molecules exist for knocking down a specific protein in vivo, including shRNA. Since these molecules are not the focus of this article, we direct the reader to review articles that better detail knockdown mechanisms of action and the advantages/disadvantages of each 5-6. 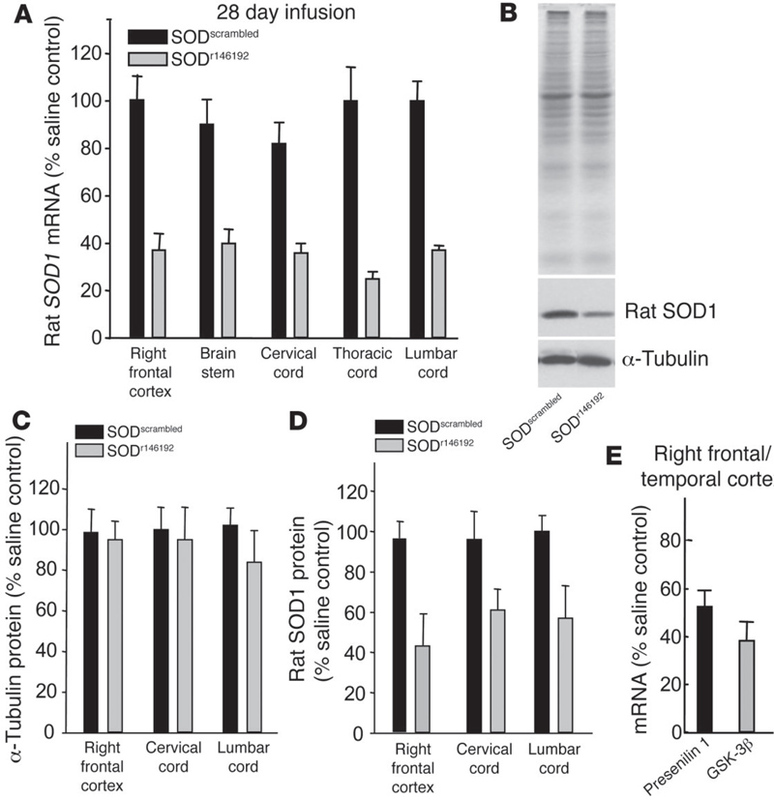 In prior work, we have used ASOs to target the protein superoxide dismutase 1 (SOD1) in a transgenic rat model of Amyotrophic Lateral Sclerosis (ALS) 7 (Figure 4). Mutations in SOD1 occur in approximately 2% of all ALS cases 8, though it has been recently hypothesized that SOD1 may play an important role in sporadic ALS as well 9-10. By decreasing total SOD1 levels in the ALS transgenic rat, survival after onset was significantly increased 7. These important data were the first to show that an ASO treatment in the CNS could have a profound positive impact on a neurological disease model. Since then, ASOs targeted to human SOD1 have entered and successfully completed a Phase I human clinical trial with minimal side effects (Clnicaltrails.gov NCT01041222), as presented at the 2012 64th Annual American Academy of Neurology. Plans to move the ASOs forward to Phase II trials are currently underway. While targeting SOD1 was the first demonstration of using ASOs to treat a neurological disease, several other studies have since been performed looking at different diseases and their respective protein targets. In 2010 and 2011, ASOs that shift splicing of the protein survival of motor neuron 2 (SMN2)were used in transgenic mouse models of spinal muscle atrophy (SMA) and resulted in a significant improvement in the disease phenotypes 11,12. These splicing ASOs are now in Phase I clinical trials in children with SMA (Clinicaltrails.gov NCT01494701). Additionally, it was recently shown that transient administration of ASOs targeted against the huntingtin gene were able to dramatically rescue the Huntington's mouse model, even after the huntingtin protein levels returned to baseline 13. In all of these studies, ASOs were delivered to the lateral ventricle to decrease total gene levels or alter gene splicing through the entire CNS. Both osmotic pumps and a single bolus injection can be used to deliver ASOs to the CSF. Pumps allow for a slow, continuous delivery, whereas the intracerebroventricular (ICV) bolus is a fast, one-time injection. We have used both of these methods with success, though we have not reported the direct comparison between pump and bolus in a single transgenic line. Using ASOs in the CNS is a powerful way to decrease total protein levels and/or change splicing of several proteins. While we use ASOs exclusively as a treatment for neurological disorders, we recognize that other fields may also benefit from this technique. As long as the protein of interest is expressed in the CNS and the ultimate goal is to achieve CNS-wide changes in gene expression, using ASOs in the demonstrated techniques may be very useful. The protocol below has been approved by the Institutional Animal Care and Use Committees at Washington University in St Louis and is in compliance with the National Institutes of Health guidelines for the use of experimental animals. If this is your first time performing surgeries, we recommend looking at the JoVE article on rodent surgeries as an introduction before beginning 14. ASOs can be delivered to the mouse CNS through both osmotic pump infusion and a single ICV bolus injection. Because of this, the procedure detailed below is broken up into two segments. Pros and cons for each method will be touched on in the Discussion section. The coordinates used in the protocols are for adult C57BL6 and B6C3 mice. Corresponding rat coordinates can be found in Table 1. Lay down a sterile drape and carefully drop the following items onto it while taking care not to directly touch anything in order to maintain sterility: osmotic pump(s), flow modulator(s), 1 ml sterile syringe(s), scalpel blade, and sections of tubing (1 piece of tubing = 5 pumps). For mice, there are three options for pumps: 14 days, 28 days, and 42 days (Figure 2A). Uncap and fill sterile 50 ml conical tubes with 15-20 ml saline solution. Up to 6 assembled pumps can be added per conical tube. Fill a p60 Petri dish with 100% ethanol. Add appropriate number of catheters to the ethanol. For mice, catheter length is 2.5 mm. Filter each ASO into as many 1.5 ml Eppendorf tubes as necessary. Include an Eppendorf tube filled with sterile 0.9% saline to fill the tubing with. Once everything is prepared, put on sterile gloves. Make sure not to touch anything that is not sterile. Change gloves as necessary. For each ASO to be used, fill a 1 ml syringe and loadpumps by placing the needle into the top hole and slowly filling until excess leaks out. Continue until all of the pumps are filled. Uncap the flow-modulators and insert into the pumps. Push the flow-modulator almost all of the way in, leaving a 3-5 mm gap. Using the scalpel blade, cut each piece of tubing into 5 equal segments. Take one piece of tubing, fill with sterile saline using a 1 ml syringe, and insert the top of the flow modulator into one end of the tubing. Then take a cannula from the ethanol and connect it to the other end of the tubing. The pump is now fully assembled. Place the fully assembled pump into the sterile 50 ml conical tube with saline for priming. The priming allows for the pumps to soak up fluid to initiate the drug delivery as well as come to the proper temperature. Priming time: 14 day pumps: 4-6 hr, 28 day pumps: 40 hr, 42 day pumps: 60 hr. When finished assembling the pumps, cap the conical tubes and place in a clean 37 °C water bath until surgery. Wipe everything down with 70% ethanol to sterilize the area and lay down sterile drapes on the table top and stereotax to create a sterile field. It is important to be mindful of the sterile field throughout the entire surgery. Turn on the following: Bead Sterilizer, Heating Pad, Light, Digital Readout, and Oxygen/Isoflurane System (Figure 1). The following items will be required if doing either a single surgery or a whole batch of surgeries as we routinely do: 1 pair of forceps, 1 curved hemostat, 1 pair of small scissors, 1 pair of small curved blunted scissors, 1 rat bone cutter, 1 straight hemostat, 5-0 nylon sutures, 1 conical tubes with 70% ethanol, 1 conical tube with 95% ethanol, 1 conical tube with iodine, 1 conical tube with hydrogen peroxide, package of sterile cotton swabs, 1 bottle of super glue, 1 tube antibiotic ointment, 1 tube of eye lubricant, and 1 electric shaver. Place the tips of both pairs of scissors, forceps, and curved hemostat into the bead sterilizer for 15 sec. Remove and place in 70% ethanol. When performing more than one surgery, re-sterilize the tips of the instruments in between animals. Turn the isoflurane to 4% and O2 to 0.4 L/min and direct gas flow to the chamber. We have our isoflurane/oxygen system calibrated at least one a year to ensure that we are delivering the proper amount of anesthesia. Place mouse in the chamber and wait until breathing is significantly slowed. Remove the mouse and perform a toe pinch to ensure the mouse is completely unconscious. Shave the hair from the top of the shoulder up to in between the eyes. If the mouse begins to wake up, place the mouse back into the chamber until the mouse is completely unconscious again, confirming with a toe pinch. Place the anesthetized mouse on the stereotax and push the nose cone over the nose. Be gentle as the teeth and bones are fragile. Direct the gas flow to the stereotax to keep the mouse anesthetized. It is important to occasionally check to make sure the mouse is completely unconscious with a toe pinch throughout the surgery. Secure the head with the ear bars. We prefer leveling ear bars, though to target the lateral ventricle, a perfectly level skull is not necessary due to the large size of the ventricle. Turn the isoflurane level down to 2.0% for maintenance. Dab eye ointment onto each eye. As seen in the video, lay a sterile drape over the mouse so that only the base of the neck and head are exposed. Then disinfect the surgical area by wiping the top of the head and neck in a circular motion starting at the center of the shaved area and moving outwards first with a cotton swab dipped in 95% ethanol, followed by a cotton swab dipped in iodine. We recommend using a rectal probe feedback temperature controlled heating system that ensures the temperature of the mouse remains at a stable 37 °C. If the temperature of the mouse decreases during the surgery, the post-surgery recovery may take longer and the resulting hypothermia can lead to aberrant protein activity, including hyperphosphorylation of the microtubule associated protein Tau15. After setting up the heating system, you are now ready to begin the surgery. Take the blunted scissors with the curve facing up and slide underneath the skin at the base of the neck back towards the left hindlimb. There should be no resistance. If there is, remove the scissors and try again. This forms the subcutaneous pocket for the osmotic pump. Wipe the skull clean with sterile cotton swabs, followed by a cotton swab dipped in hydrogen peroxide to enhance bregma. Wipe down the 50 ml conical tubes that contain pumps to maintain sterility of the pumps. Carefully take a pump from the conical tube using the curved hemostat, taking extra care that the pump does not touch the sides of the conical tube. Hold the base of the pump with forceps and push the flow modulator in the rest of the way with the curved hemostat. Hold the pump where the flow modulator and tubing meet with the curved hemostat. Insert the pump under the skin at the base of the neck and push it back toward the left hindlimb as far as it will go without resistance. Be careful to not let the catheter touch anything. With the curved hemostat, grab the cannula at the groove where the top meets the pedestal. Move the cannula driver into position and secure into place. Place a single drop of super glue on the base of the cannula. Push the top of the cannula into the driver and position so that the tubing is pointed straight back. Touch the catheter tip to bregma and zero the coordinates on the Digital display. Raise the catheter and move 1.1 mm laterally to the right and 0.5 mm posterior (Figure 2B). Hold the skin out of the way with the curved hemostat. Drive the thin metal catheter through the skull until the plastic cannula base is securely pressed against the top of the skull. The metal catheter can be driven directly through the skull in mice due to the relative thin skull. If using rats, drill a hole in the skull before lowering the catheter. Pull any skin that has glue on it away from the skull. With the cannula driver holding the cannula/catheter in place, wait 1-2 min for the glue to fully dry. When practicing, to assess catheter placement, inject 20-40 μl of 2.5% FastGreen Dye through the tubing (Figure 2C). Wait 2-3 min, perfuse the mouse with 1X PBS 0.03% heparin, and remove the brain. Cut coronally at the catheter site. If the catheter was placed in the ventricle, the dye will be perfused throughout the mouse ventricular system (Figure 2D). Hold the catheter in place with the curved hemostat while raising the driver. Slowly release the hemostat to ensure that the cannula is properly secured to the skull. With a cotton swab, press down on the top of the cannula. Fit the rat bone clippers into the grove between the top and base of the cannula. Clip off the top of the cannula while still pressing down with the cotton swab. Try and keep the clippers level so as not to detach the cannula from the skull. If the cannula does come unglued, quickly re-glue and apply pressure with a cotton swab for an additional 2 min. Using the 5-0 suture thread, regular hemostat, and forceps, suture along the full opening, paying extra attention right over the cannula. We use a running horizontal mattress suture (see Figure 5) due to the larger incision over the skull. Apply a dab of antibiotic ointment over the head and neck. Unscrew the ear bars and loosen the nose cone. Remove the mouse from the stereotax and place on a warming pad for recovery. Monitor the mice closely for the duration of recovery, typically ranging from 10-30 minutes. Check every 2-3 minutes until the mouse begins walking around and grooming itself. Monitor the mice daily after the surgery for the first week. If a mouse appears to be in pain or distress, we recommend providing the mouse with a 5 mg/kg subcutaneous injection of Carprofen once every 24 hr for up to 5 days in order to relieve the pain. If there appears to be an infection, generously apply antibiotic ointment to the area daily and consult an Attending Veterinarian to ensure that the wound properly heals. Remove the 5-0 nylon suture 7-10 days following surgery to prevent irritation from the suture thread. After the pump is done actively infusing ASO, it can be either changed or completely removed. Follow the same pre-surgery procedure as above with the following changes: 1) you will not need the curved scissors, curved hemostat, rat bone cutters, nor the Digital Display, and 2) instead of prepping the head of the mouse, shave and disinfect the back of the mouse at the junction of the pump and tubing. Make a 1.5 cm incision on the back of the mouse, perpendicular to the pump/tubing junction, using forceps and scissors. Carefully pull the pump out of the incision without significantly pulling/pushing on the tubing as it may jar the catheter. To remove the pump, clip the tubing about 0.5 cm above the flow modulator and touch the superglue to the tubing to seal it shut. Wait 1-2 min for the glue to dry. Place the tubing back into the incision and suture shut. Dab antibiotic ointment onto the sutured skin and place the mouse on a heated recovery pad. To change the pump, have freshly made pumps ready along with a 10 cm dish filled with 95% ethanol. Catheters are not needed with the new pumps. Grab a new pump with the forceps. Dip your fingers into the ethanol, take hold of the pump, and discard the flow-modulator. Then, carefully and slowly pull off the old pump from the flow modulator attached to the tubing and cannula. As soon as it is off, slowly slide the new pump on, ensuring that the flow modulator never touches the outside of the mouse. Reinsert the new pump through the incision back into the subcutaneous packet and suture the skin. Dab antibiotic ointment on the wound and place mouse on recovery pad. Just as with the pump implantation, monitor the mice daily after the surgery to check for pain/discomfort and infections. Treat with Carprofen and antibiotics as deemed necessary. Follow the same pre-surgery procedure as in Section 2 above with the following changes: 1) you will not need curved scissors, curved hemostat, or rat bone cutters; 2) clean a 10 μl Hamilton syringe and needle with sterilized water and load with ASO; and 3) attach the syringe and needle to the stereotaxic apparatus where the cannula driver was located. Using forceps and a small pair of scissors, make an incision from the base of the neck up to in between the eyes. Move the syringe/needle into place and secure. Make sure that the beveled portion of the needle faces posterior. Lower the needle until it touches bregma. Zero all of the coordinates. Move the needle laterally to the right 1.0 mm and anterior 0.3 mm (Figure 3A). Slowly drive the needle through the skull just until the needle hole is flush with the top of the skull. Again, this can be done due to the thinness of the mouse skull. Zero the z-coordinate and lower the needle to -3.0 mm at a rate of 1 mm/sec (Figure 3B). Wait 2-3 min for the brain to seal around the needle. Deliver the full 10 μl of ASO at a rate of 1 μl per sec. Wait 2-3 min. We use a 1 μl infusion rate for ASOs into the ventricle, though this rate may differ between different drugs. When practicing, check for proper placement of needle by delivering 10-20 μl of 2.5% FastGreen Dye. Perfuse the mouse with 1X PBS 0.03% heparin soon after dye infusion and make coronal sections of the brain to verify that the dye is in the ventricular system (Figure 3C). Hold a cotton swab against the skull at the base of the needle. Raise the needle at a rate of 1 mm per sec. As soon as the needle is out of the skull, roll the cotton swab over the needle hole and hold for 1 min to prevent any ASO from leaking out. Suture the skin closed, apply antibiotic ointment, and place mouse on heated recovery pad. Depending on ASO concentration, it may take 20 min to a couple hours to fully recover. After pump infusion or a designated time after the ICV bolus injection (we routinely use four weeks), it is important to test the efficacy of the ASOs. We recommend taking various regions of brain and spinal cord to measure levels/isoforms of the target gene, both at the mRNA level using quantitative real-time PCR as well as the protein level using either Western Blot or ELISA (Figure 4 for a published example). This will help determine ASO efficacy throughout the different CNS regions. If the half-life of the targeted protein is long, we advise waiting longer after ASO infusion in order to assess maximum protein knockdown or splicing. It is also important to test oligo distribution. Pump infusions result in distribution through both ipsilateral and contralateral hemispheres, though a higher ASO concentration is often seen in areas closer to the ventricular system 16. ICV bolus injections yield a more uniform distribution of oligo through the CNS 16, though the effects may not last as long. We direct the reader to Southwell et al. to see a direct comparison of pump versus bolus oligo distribution 16. We also recommend testing multiple doses as well as the duration of action of the ASOs since each ASO will behave slightly differently in vivo. ASOs typically have a relatively long duration of action, with target knockdown or splicing lasting several months post ASO delivery. In addition, some ASOs will work better than others and some gene targets will be easier to knockdown than others. Because of this, when screening ASOs to determine the lead candidate, we recommend testing at least 3-5 ASOs in vivo with an n = 4-6 adult mice per ASO as a first pass. If using a drug other than ASOs, it will also be important to pilot the ideal drug concentration, drug duration of action, and CNS drug distribution for that specific compound. Table 1. Surgery Coordinates. 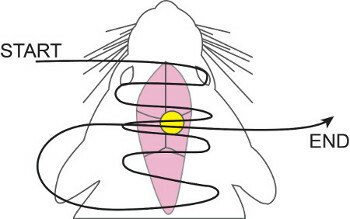 The coordinates used to hit the right lateral ventricle in both mice and rats when implanting osmotic pumps as well as performing an intracerebroventricular (ICV) bolus. Both coordinates, for pumps and ICV bolus, target the right lateral ventricle. We use two different sets because these are what we have the most experience with and know provide excellent distribution of ASO. Figure 1. Stereotaxic Setup. (A) The necessary stereotaxic equipment for Alzet pump and Bolus injection surgeries. i) Glass Bead Sterilizer. ii) Digital Readout. iii) Stereotaxic base with moving arms. iv)Temperature Controlled Heating Pad. v)Isoflurane/Oxygen System. vi)Isoflurane Chamber. (B) Close up of the nose cone and ear bars. (C) Two attachments required. Left: Syringe/needle holder for ICV bolus injections. Right: Cannula Driver for Osmotic pump implantation. Figure 2. Alzet Osmotic Pump Implantation. (A) Alzet osmotic pump options for mice. 14 day pumps (0.25 μl/hr), 28 day pumps (0.25 μl/hr), 42 day pumps (0.15 μl/hr). (B) Coordinates for pump implantation from bregma: -0.5 mm Posterior, -1.1 mm Lateral (Right), and -2.5 mm Ventral (length of catheter). (C) After driving the catheter through the skull and gluing the cannula, dye is flushed through the catheter to assess proper placement of the catheter in the lateral ventricle. (D) Perfused brain immediately after dye administered as in (C). If catheter is successfully placed in ventricle, the dye will be distributed throughout the mouse ventricular system. Figure 3. Intracerebroventricular Bolus Injection. (A) Coordinates for bolus injection from bregma: +0.3 mm Anterior, -1.0 mm Lateral (Right), and -3.0 mm Ventral. 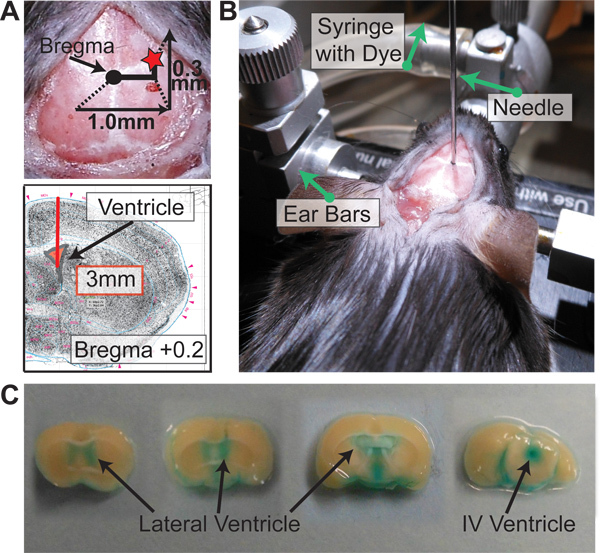 (B) After driving the needle through the skull -3.0 mm ventral, dye is pushed through the syringe to assess proper placement of the needle in the later ventricle. (C) Perfused brain shortly after dye administered as in (B). 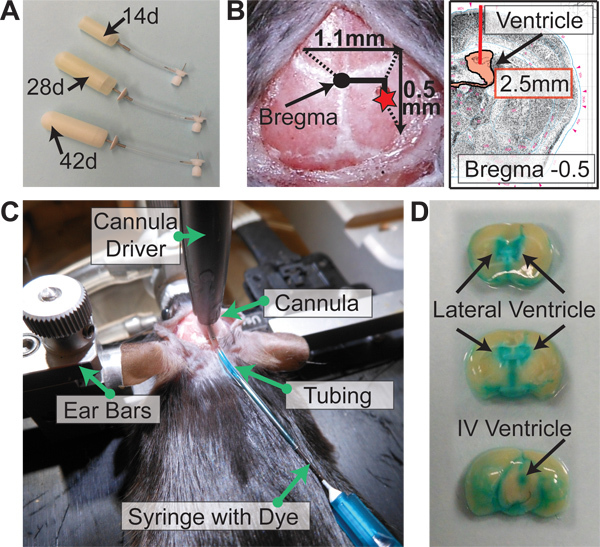 If needle is successfully placed in ventricle, the dye will be distributed throughout the mouse ventricular system. Figure 4. Antisense Oligonucleotides reduce rat SOD1 in vivo (figure taken directly from Smith et al. 7). (A-D) Antisense SOD1 oligonucleotides SODr146192 or SODscrambled were infused for 28 days into the right lateral ventricle of normal rats at 100 μg/day. (A) Endogenous SOD1 mRNA levels from brain and spinal cord as measured by qRT-PCR. 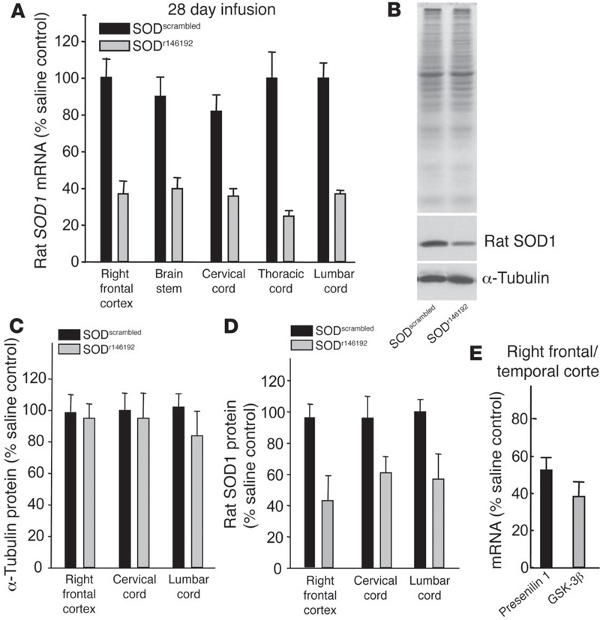 (B) SOD1 and a-tubulin protein levels following ASO infusion. (C and D) Protein levels for tubulin and SOD1 quantified for different regions of the brain following infusion. (E) ASOs against presenilin 1 or GSK-3β were infused for 2 weeks into the right lateral ventricle of nontransgenic mice and mRNA levels assessed in the right frontal/temporal cortex. Reproduced with permission from the American Society for Clinical Investigation. Click here to view larger figure. Figure 5. Running Horizontal Mattress Suture. 5-0 nylon suture thread is weaved in and out of the skin, starting anterior and working posterior, concentrating more over the cannula. Once having reached the most posterior point, the suture thread is then brought back up and threaded over the cannula once more. This ensures proper wound closure and prevents the cannula/tubing from working through the skin. The ability to deliver drugs globally in the CNS as shown in the video is an extremely powerful technique that is easy to both learn and use. With practice, a single pump implantation or an ICV bolus can be completed in 10 min, allowing for large cohorts of mice to be treated at the same time. This is especially useful for studies with a behavioral readout, as larger numbers for mouse behavior are critical to help see significant differences. Based on our experiences delivering ASOs via pumps and bolus injections, we have observed some pros and cons to each method. It should be noted that these are the opinions in our lab and may not be true for all mouse and rat models. We find an advantage of using the pumps is their ability to deliver a high amount of ASO since the ASO is distributed over a much longer period of time. This usually equates to longer sustained knockdown or splicing after active ASO infusion, though this may not always be the case. The pumps also allow for a precise time frame of ASO delivery (14 days, 28 days, or 42 days) and the pumps can be changed once to allow for even longer active ASO infusion. However, we have noticed that changing pumps more than once increases the variability due to the formation of fibrous pockets around the pump that prevent the pump from properly absorbing fluid. A disadvantage of the pumps is that some mice do not tolerate the pump as well as others. If the transgenic line you are working with is more fragile, a pump may be too cumbersome. The pumps also need to be removed after the final infusion, subjecting the mice to another surgery and added anesthesia. If doing behavior work, it is especially important to remove the pump and allow for at least 1-2 weeks of recovery since the presence of the pump will affect some behaviors in the mice. With ICV bolus injections, one advantage is cost. There is an upfront investment to purchase the syringes and needles, but over time, bolus injections are more cost-effective since there are no pumps/tubing/catheters to purchase. Overall, there is less up-keep with the ICV bolus injections due to the lack of cannulas and pumps. We also find that ICV bolus can be used to deliver ASOs to younger and/or more fragile mice. A disadvantage of the ICV bolus is that it is a single injection. Not as much overall ASO can be delivered through this route, and if the duration of action of the ASO being used is short, the knockdown/splicing effects will also be short-lived. 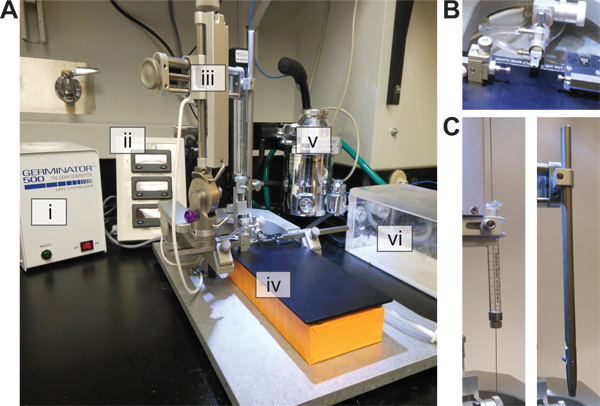 Both the osmotic pumps as well as the ICV bolus have the capability to deliver ASOs that can knockdown proteins or alter splicing of genes in the entire rodent CNS, a technique that has wide applications in multiple neuroscience-related fields. We suggest piloting both methods of delivery if you are unsure which route of administration is best suited for your specific study. The authors receive their Antisense Oligonucleotides from Isis Pharmaceuticals. Open Access fees sponsored by, Alzet Osmotic Pumps. We would like to thank Curt Mazer from Isis Pharmaceuticals for providing advice pertaining to the ICV bolus surgery, as well as Isis Pharmaceuticals as a whole for supplying our lab with ASOs. Further, we would like to thank Carey Shaner for reviewing this article. TMM and SLD are supported by NIH Grants P50AG005681, K08NS074194, and R01NS078398. Vinyl Catheter Tubing DURECT 7760 ID: 0.027", OD: 0.045"
Crooke, S. T., Bennett, C. F. Progress in antisense oligonucleotide therapeutics. Annual Review of Pharmacology and Toxicology. 36, 107-129 (1996). Sazani, P., Kole, R. Therapeutic potential of antisense oligonucleotides as modulators of alternative splicing. The Journal of Clinical Investigation. 112, (4), 481-486 (2003). Taylor, J. P., Hardy, J., Fischbeck, K. H. Toxic Proteins in Neurodegenerative Disease. Science. 296, (5575), 1991-1995 (2002). Ross, C. A., Poirier, M. A. Protein aggregation and neurodegenerative disease. Nature Medicine. 10, S10-S17 (2004). Miller, T. M., Smith, R. A., Kordasiewicz, H., Kaspar, B. K. Gene-Targeted Therapies for the Central Nervous System. Archives of Neurology. 65, (4), 447-451 (2008). Vickers, T. A., Koo, S., Bennett, C. F., Crooke, S. T., Dean, N. M., Baker, B. F. Efficient Reduction of Target RNAs by Small Interfering RNA and RNase H-dependent Antisense Agents. The Journal of Biological Chemistry. 278, 7108-7118 (1074). Smith, R. A., Miller, T. M., et al. Antisense Oligonucleotide therapy for neurodegenerative disease. The Journal of Clinical Investigation. 116, (8), 2290-2296 (2006). Rosen, D. R., Siddique, T., et al. Mutations in Cu/Zn superoxide disumutase gene are associated with familial amyotrophic lateral sclerosis. Nature. 362, 6415-62 (1993). Haidet-Phillips, A. M., Hester, M. E., et al. Astrocytes from familial and sporadic ALS patients are toxic to motor neurons. Nature Biotechnology. 29, 824-828 (2011). Furukawa, Y. Pathological roles of wild-type Cu,Zn-superoxide dismutase in Amyotrophic Lateral Sclerosis. Neurology Research International. 2012, 1-6 (2012). Hua, Y., Sahashi, K., et al. Antisense correction of SMN2 splicing in the CNS rescues necrosis in a type III SMA mouse model. Genes and Development. 24, 1634-1644 (2010). Passini, M. A., Bu, J., et al. Antisense Oligonucleotide Delivered to the Mouse CNS Ameliorate Symptoms of Severe Spinal Muscular Atrophy. Science Translational Medicine. 3, (72), (2011). Kordasiewicz, H. B., Stanek, L. M., et al. Sustained Therapeutic Reversal of Huntington's Disease by Transient Repression of Huntingtin Synthesis. Neuron. 74, (6), 1031-1044 (2012). Planel, E., Richter, K. E. G., et al. Anesthesia Leads to Tau Hyperphosphorylation through Inhibition of Phosphatase Activity by Hypothermia. The Journal of Neuroscience. 27, (12), 3090-3097 (2007). Southwell, A. L., Skotte, N. H., Bennett, C. F., et al. Antisense oligonucleotide therapeutics for inherited neurodegenerative diseases. Trends in Molecular Medicine. In press, corrected proof (2012). Kole, R., Krainer, A. R., Altman, S. RNA therapeutics: beyond RNA interference and antisense oligonucleotides. Nature Reviews Drug Discovery. 11, 125-140 (2012).